Amazingly, little scientific investigation has been directed toward the concentration camp Lublin-Majdanek in central Poland, even though orthodox Holocaust sources have claimed that between fifty thousand and over a million Jews were murdered there. Until the appearance of this present work, the only works on Majdanek available have been propaganda pieces written by historians serving or trained under Poland's communist regime. Mattogno and Graf have filled this glaring research gap with a monumental study that expertly dissects and repudiates the myth of homicidal gas chambers at Majdanek. 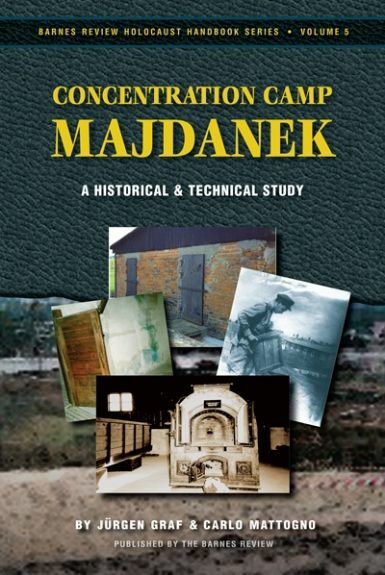 Based on exhaustive research of the primary sources and a thorough exploration of the physical remainders of the former concentration camp, Concentration Camp Majdanek strikes a death blow to the lie of homicidal gassings at Majdanek (and also punctures the legend of mass executions of Jews in tank trenches called "Operation Harvest Festival"). The authors' investigations lead to unambiguous and unsparing conclusions about the real history and the actual functioning of the camp which thoroughly destroy the official theses without excusing the abuses tolerated by Majdanek's wartime commanders. Majdanek was not an ‘extermination camp’, but a labor camp, and the vast majority of inmates who died during their incarceration succumbed to diseases rather than wanton killings. With this tome, Mattogno and Graf have once again produced a careful, methodical investigative work that sets the standard for all other treatments of Majdanek. This third edition has three new supplements reviewing new developments in this field of research, which undergird the authors' original conclusions. Click her to look at this book's Table of Contents and its first chapter.